You feel like you’re treading water. Every so often you go under water but muster up the energy to come back up for air. But you’re not sure how much longer you can keep this up. It’s all you can do to get through the day. 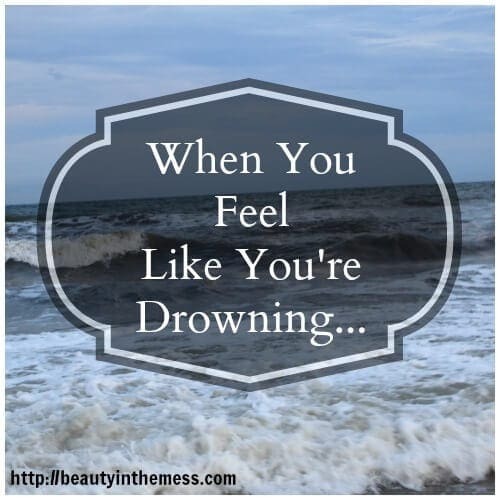 When you feel like you’re drowning, know that you are not alone. It’s hard. It’s dark. It’s lonely. Your joy seems so far away. You can’t remember the last time you laughed or enjoyed cuddle time with your children without thinking of your to-do list. The stress of life is wearing you down. Some days are better than others. But you still feel alone. I don’t have the answers. I’m just trying to keep my head above water myself. I can not tell you the number of times I am just in tears because life is overwhelming. The laundry. The meals to be made. Tending to the needs of everyone. Little sleep. Trying to hold everything together. I can’t do it alone. It’s not humanly possible. I’ve been told that I need to make time for myself. I have to or depression will follow. More “me time.” Well, that’s a lot easier said than done. And I’m not so sure that’s the answer. I spent a weekend away at Allume back in October. That weekend would probably be considered “me time.” It was definitely girl time. I came back just as exhausted. “Me time” doesn’t fill me up. But intentional time in the Bible does. Um, it’s not easy. I stay up way too late. I’m growing a baby as well as taking care of my littles. It’s exhausting. Early to bed, early to rise? Haha! Um, no. The times I try to go to bed early are the nights when my children make a pact to wake up at different times throughout the night to keep me awake. I drink caffeine to keep going during the day, and stay awake all night. It’s a vicious cycle that robs everyone of their joy. We have to make the time. There may even be tears. Tears of relief. Tears of brokeness. A release of the hurt and pain that has been bottled up. Release of the burden of trying to do it all on your own. Freedom in knowing He carries our burden. He is carrying you, dear friend, when you don’t think you can take one more step. When you fall into bed exhausted and struggle to get up the next morning. He’s there. He sees you. You aren’t alone. He hasn’t left you. Let’s stand together. Stop trying to be perfect. Stop comparing ourselves to see we see on the internet. Stop trying to be perfect. Perfection won’t come until we are in Heaven. Let’s do life together. Tell our stories. Cry with one another. Share our hearts. And stop pretending everything is okay when it’s not. Well said. The times that we feel like we’re drowning are so hard, but I love looking back and seeing how God delivered me through those times. Blessings on you!